Most Holy Death – Exploring the sanctification of death in the popular faith traditions of the Americas. Have you heard of Santa Muerte? San la Muerte? or perhaps Rey Pascual? Faith traditions in the Americas are as diverse and expressive as the many cultures they emerge from, but one particular set of traditions has captured the eye and ire of official orthodoxies in government, law enforcement and the Christian church, the passionate veneration of Most Holy Death. SkeletonSaint.com is a collaborative venture between Dr. R. Andrew Chesnut, Bishop Walter Sullivan Chair in Catholic Studies at Virginia Commonwealth University, and author of Devoted to Death: Santa Muerte, the Skeleton Saint, David Metcalfe, and Liminal Analytics, presenting a multi-faceted exploration of the sanctification of death in the popular faith traditions of the Americas. Join us as we examine the complex faith traditions that develop around the sanctification of one of humanity’s oldest fears, and continue a conversation that began at Viva La Muerte!, a lecture and panel discussion, hosted by the Morbid Anatomy Library at The Observatory in Brooklyn, New York. R. Andrew Chesnut, Ph.D., holds the Bishop Walter F. Sullivan Chair in Catholic Studies and is Professor of Religious Studies at Virginia Commonwealth University. He is currently conducting research on the new religious economy of Latin America and the cult of Santa Muerte (Saint Death). 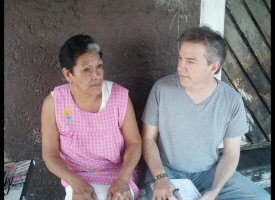 A specialist in Latin American religion, he is the author of “Competitive Spirits: Latin America’s New Religious Economy” (Oxford University Press, 2003), “Devoted to Death: Santa Muerte, the Skeleton Saint” (Oxford University Press, December 2012), and of “Born Again in Brazil: The Pentecostal Boom and the Pathogens of Poverty” (Rutgers University Press, 1997).. He also blogs for the Huffington Post. David Metcalfe is an independent researcher, writer and multimedia artist focusing on the interstices of art, culture, and consciousness. He is a contributing editor for Reality Sandwich, The Revealer, the online journal of NYU’s Center for Religion and Media, and The Daily Grail. Metcalfe writes regularly for Evolutionary Landscapes, Alarm Magazine, Modern Mythology, Disinfo.com, The Teeming Brain and his own blog The Eyeless Owl. His work has been featured in The Immanence of Myth (Weaponized 2011), Chromatic: The Crossroads of Color & Music (Alarm Press, 2011) and Exploring the Edge Realms of Consciousness (North Atlantic/Evolver Editions 2012). Metcalfe is an Associate with Phoenix Rising Digital Academy, and is currently co-hosting The Art of Transformations study group with support from the International Alchemy Guild.